Not Accepting Friendships on Facebook, Does it Make Me Bad? A friend of mine recently made a sarcastic comment about being 'strict' with my friendship on facebook (I hope she's reading this, cos she knows who she is!). Basically, she asked why I won't add some people on my facebook account. I explained it to her but I figured there are a lot of people who are asking that question as well, so what better way to answer everyone than by writing a post about it! Everybody knows about facebook and it's uses. Connecting with old friends, meeting new friends, keeping in touch, networking and the works. As much as I'm an introvert, I love meeting people, under the cover of the Internet, because I don't have to exactly 'meet' you. However, when people randomly add you without an introduction or mutual friend for that matter it sends off alarm bells in my head. Sure, I have a blog, and my name is on the Internet, so anyone can find me, technically, but with facebook you can draw the line, even though it is to a minimal degree. Trust me, I will do what I can to keep some part of my life quite private and if it means not accepting every friendship request I get on facebook, then so be it! Apparently, facebook isn't exactly helping matters these days by randomly suggesting friends with no mutual friend, what's up with that??! I really don't bother with the suggested friends any more, because it's becoming quite pointless. I know a lot of people argue that's the best way to make friends is online. Believe you me, I've made my fair share of friends online, and I still do but there are various ways to go about it. 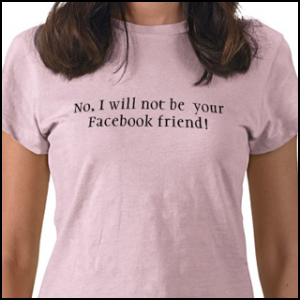 If you send me a blank friendship request, then forget it! Every if we have some mutual friends, as long as I don't know you, I will not add you; It's that simple. However, if an email is sent, possibly before the friendship request then that stands a chance of being accepted, if we get along. Now that said, I do have a public page which is related to SEO, please feel free to 'like' it. Or better still follow me on twitter or join my linkedin network. Thanks! !